Contact us for more information about the high-risk pregnancy services at Fort Sanders Perinatal Center or to request an appointment. No referral is necessary unless required by your insurance provider. For emergencies that develop at night or on weekends, please call our office number at (865) 331-2020. Our 24-hour answering service can contact our physicians within moments of your call. Going directly to the emergency department at Fort Sanders Regional Medical Center or the closest hospital is recommended if a patient needs to be seen immediately. High-risk pregnancy screening and diagnostic tests are used to detect chromosome defects. It is important to recognize the distinction between screening and diagnostic tests. A screening test reveals a risk calculation or risk assessment for a particular problem. A diagnostic test provides a yes or no answer about numeric chromosome problems. Direct examination of chromosomes is required to determine the presence of a numeric chromosome defect, such as Down syndrome, trisomy 13 or trisomy 18. During pregnancy, DNA samples typically are collected through chorionic villus sampling (CVS) (typically done between 11 and 13 weeks) and amniocentesis (typically performed between 15 and 22 weeks). Our genetic counselors are available to provide guidance about different high-risk pregnancy screening and testing options unique to your needs. There are ways to estimate risk for birth defects for families without chromosomal problems. One common way is considering the mother’s age. Women over 35 are at an increased risk for chromosome problems and should be tested. But age isn’t the only determining factor. Many younger women still need pregnancy screenings. Regardless of age or calculation of risk, we offer the high-risk pregnancy screening options of CVS or amniocentesis to all pregnant women who desire these tests. Depending upon your insurance plan, the testing may or may not be covered. Amniocentesis involves drawing a small amount of amniotic fluid from around the baby. Amniotic fluid can be used for a variety of analyses, including chromosome testing, detecting certain viral infections, detecting open neural tube defects, and checking for a variety of genetic conditions. The risks associated with amniocentesis are low. Specifically, the risk for miscarriage from amniocentesis is estimated at 1 in 200 or less. Amniocentesis is performed after you have a detailed ultrasound examination. During the ultrasound, we determine the location of the placenta, the quantity of amniotic fluid, and whether an amniocentesis can safely be done or if it’s too early in the pregnancy to perform the procedure. After the amniocentesis procedure, you are free to go home but should have reduced activity for 24 hours. You can then resume normal activity. Following the procedure, you may experience some mild cramping but should not have severe cramping, fever or bleeding. Some pregnancies may be at increased risk for chromosomal abnormalities or certain other conditions. Genetic counseling and chorionic villus sampling (CVS) may be offered. CVS involves obtaining a small fragment of the placenta (villous). The sample can be used to diagnose conditions such as chromosomal conditions (ex. Down syndrome) and genetic conditions (ex. Tay-Sachs and Sickle-cell anemia) . The risk for miscarriage from CVS is estimated at approximately 1%. After the CVS procedure, you are free to go home but should have reduced activity for 24 hours. You can then resume normal activity. Following the procedure, you may experience some mild cramping and bleeding but should not have severe cramping, fever or heavy bleeding. 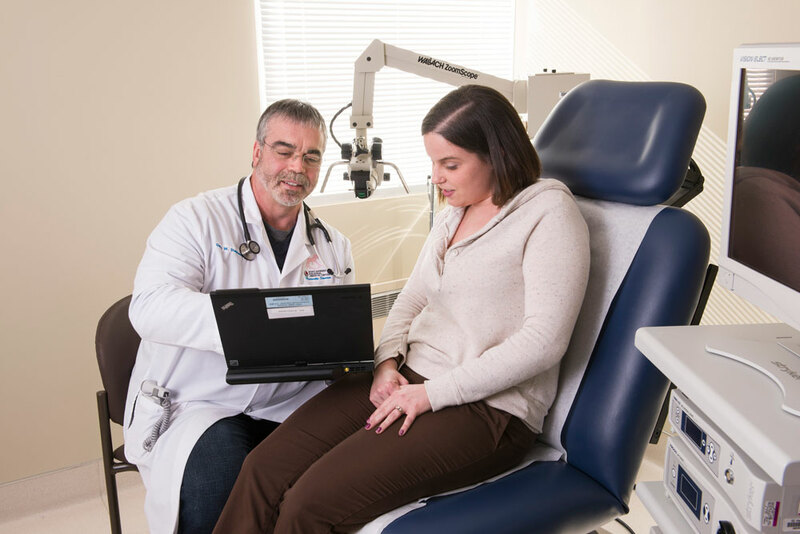 Fort Sanders Perinatal Center was the first in East Tennessee to be accredited by the American Institute of Ultrasound in Medicine in 1996 for obstetrical ultrasound. We perform high-resolution ultrasound and fetal heart studies for our patients, as well as for patients from many referring obstetricians. Ultrasound, or sonography, uses sound waves to obtain images of the baby, uterus, placenta and cervix. Ultrasound can be used for a variety of purposes during pregnancy, including checking the location of a pregnancy, assessing due date and growth of the baby, and evaluating the embryo/fetus for abnormalities. Newer, specialized studies are important adjuncts to care for women who have certain pregnancy complications, such as high blood pressure or isoimmunization, or who have had problems with preterm labor. Early into pregnancy, the primary use of ultrasound is to verify the pregnancy is within the uterus rather than outside the uterus (ectopic pregnancy). Ultrasound also is used to determine if the mother is carrying one baby rather than twins or triplets, and to confirm the due date for the pregnancy. Ultrasound examinations can be done throughout pregnancy. An ultrasound performed at this time in the pregnancy is primarily used to assess for structural abnormalities and growth of the fetus. Ultrasound at this stage in the pregnancy is less accurate than earlier sonography for determining the due date. The reason for this is that most of the variation in the growth of babies happens in the third trimester of pregnancy. If we identify a baby who is growing too rapidly for this stage in pregnancy, we worry about the mother having elevated blood sugars or diabetes. This can be checked via blood testing. If we identify a baby who is growing too slowly, we can sometimes identify ways to help the baby grow better, and we also can recommend tools for assessing ongoing growth and good health of the baby for birth. Ultrasound later in pregnancy also can be used to recheck the baby for anatomic structures that were not seen clearly earlier on. This is particularly important in pregnancies where a prior baby in the family had a late developing birth defect, such as hydrocephalus.